By Eric Clapton. Arranged by Michael A. Silvestri. Score, Set of Parts. 19 pages. Published by Michael A. Silvestri (H0.239915-816582). 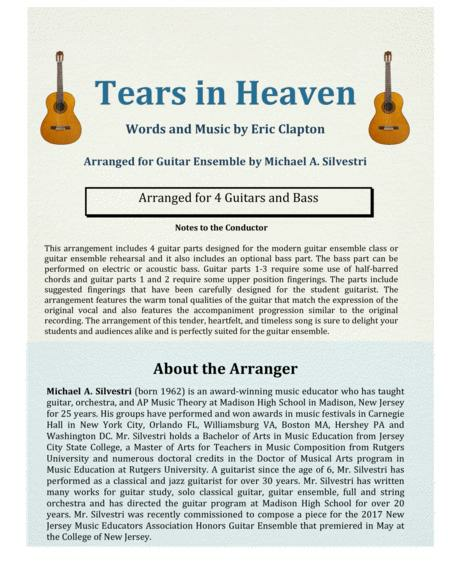 Guitar great Eric Clapton's "Tears in Heaven" is now available for your guitar ensemble! This touching and heartfelt song has been carefully arranged for 4 guitars with an optional bass part. The arrangement features the warm guitar tone that captures the expression of the original vocal and it is perfectly suited for guitar ensemble or guitar quartet performance. 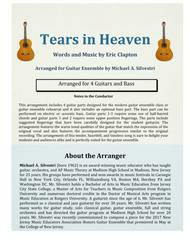 All parts have been designed for the student guitarist and include suggested fingerings. This arrangement is sure to delight your students and audiences alike and it will be a welcome addition to your next performance! .